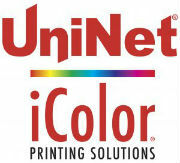 Uninet has over 25 years of experience in digital toner pigment production. Offering speciality toners, such as the double white and fluorescent tones it has become the supplier of renowned machine manufacturers. 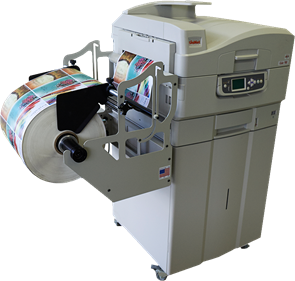 Digital roll printing has become available with the iColor product family affordably, thus making economical even short run label pressing or pressing labels with varied information. Even speciality toners can be used, to print white behind colour within the same run, and our fluorescent tones are suitable for use as individual decoration or as counterfeit protection. Varying information can also be pressed with data base link facilitating the pressing of labels with unique graphic even in one pass. Our presses bring close the advantages of digital technology: flexible, fast production with quick response to changing demands, low prepress costs (no need for ide plates), mitigate reject, no need for changeover time, consistent and repeatable high quality. Digital label press with LED technology. The CMYK print is made using four colours. It is suitable for printing on a large variety of self-adhesive media substrates. The press is capable to print on pre die cast rolls. With the use of the speciality toner is capable to white tone printing, and print white behind colour in one pass, to achieve sufficient tone intensity and density even on transparent substrates. For it contains no solvents content the tones are highly resistant to mechanical and chemical impacts. Maximum printing speed: 9m /min. The same technology is applied as with press iColor700, in a high performance robust design. Increased track width and roll size make medium run production economical, and the posterior processing of ready rolls on traditional printing presses. The ready labels are finished digitally by two laminating and cutting presses with a digitally controlled plotter to cut out the printed label, to save costly production of specific dies. 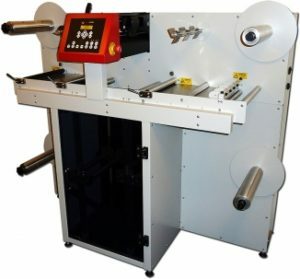 Digital automated label finishing press. 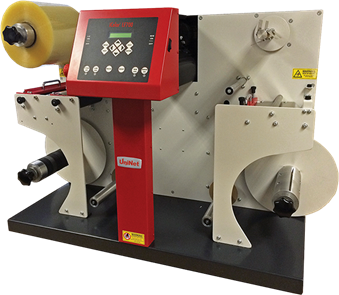 The press laminates (with self-adhesive laminating material), die cuts and removes matrix of rolled labels. Die cutting is made by means of a plotter, with no need for dies, the form of the label is processed digitally and following the register the label is blade cut. 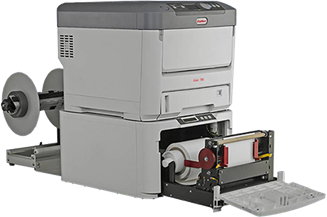 Big brother of printing press LF700 with extended track width and increased capacity. The extended functions include double rolling unit enabling after longitudinal cutting the splitting of narrow rolls, and an optional secondary cutting die which doubles the cutting speed. Laminating foil with carrier can be used on this press.